I was born in Newcastle-on-Tyne in 1924. In 1938, at the age of 14, I joined the 11th Hussars as a trumpeter and band boy. I arrived in the regiment in March 1939 in Helmieh, Egypt. In July I went up to the Western Desert and was sent back to Helmieh after a short time. As a non-combatant I was returned to England in 1940 and joined the combined band of the 11th Hussars and 12th Royal Lancers. I finished my boy service in 1943 and decided to leave the band and return to regiment duty to fight in the war. On 2 March 1944, the day after my 20th birthday, I was posted into D Squadron of my regiment, the 11th Hussars (Prince Albert’s Own), which was stationed in the forest at Ashridge Park, Berkhamstead. When I arrived and reported to D Squadron Head Quarters (SHQ), I was surprised and pleased to meet the Squadron Leader, Major Tony Crankshaw MC, whom I knew in Egypt when he was a subaltern and I was a band boy/trumpeter in Helmieh. I also knew the Squadron Sergeant Major and several other people in the regiment of all ranks, including many friends that I had previously served with in Egypt. My first nine weeks ‘back home’ in the regiment were spent learning to drive and operate the armoured cars that the regiment was equipped with. This was necessary because after I left the band I had spent fifteen months training on tanks, in both the 54th and 55th Training Regiments, Royal Armoured Corps. The 11th was equipped with Daimler Armoured Cars (DAC), Daimler Scout Cars (DSC), Staghound Armoured Cars (SAC), Humber Scout Cars (HSC) and American White Company Scout Cars (WSC). Throughout this training period I attended courses on demolitions, explosives and booby traps, and the waterproofing of our vehicles to make them seaworthy ready for wading ashore in France. We practiced wading ashore at Sheerness. In our ‘spare’ time back in the woods at Ashridge Park, the regiment practised reconnaissance patrol procedures and improving radio communications as well as advanced map-reading skills. Eighteen days after I arrived in the squadron I was promoted lance corporal, to be the troop corporal (driver/radio operator/ and gun survey NCO) of our Gun Troop. The Gun Troops were equipped with a HSC for the troop officer and troop corporal and two American half-tracked vehicles in which our French 75mm guns were mounted. During May 1944 we spent hours of extra training in the tactical battle use of the 75s, much of which had been finessed by the regiment when it was fighting in Italy. It had been decided that the Regimental Head Quarters (RHQ), together with C and D Squadrons, were to be the first party of the regiment to land on the beaches in Normandy during the invasion of France. They were loaded at London docks into a ship called Bristol City, and arrived at Arromanches on 9 June 1944, D-Day plus three. Both squadrons were put ashore after being re-loaded into Tank Landing Craft (LCT). The second landing party from the regiment was to be B Squadron, together with the Gun Troops of C and D Squadrons. We too sailed from London docks on board an American Liberty Ship T29, and we arrived off JUNO beach on 13th June, D-Day plus seven. The Gun Troops of C and D Squadrons were to be landed on JUNO beach at Courseulles-sur-Mer. When we arrived close inshore to the French coast, the sea was covered with ships as far as the eye could see. When our ship anchored we got into our cars and we were lifted over the side and lowered into a LCT. Both C and D Squadron’s HSCs were positioned together up at the front facing the off-loading ramp. The guns of both squadrons and some of B Squadron’s armoured and scout cars were loaded behind us into the LCT. A very young American navy ensign captained our craft. He had a small crew, one of whom was the coxswain who had to be up at the front as we approached the shore to test the depth of water. His job was to tell the skipper when the water was shallow enough to let down the ramp when he considered it to be safe enough for us to drive off (4ft?). He had a long pole for this task. We started our car engines and waited for the ramp to go down, ready for us to drive off into France. When the ramp was lowered I looked towards the beach, and saw to my horror and surprise that we were much further from the shore than we had been told to expect. Instead of it being about two to three hundred metres for us to drive in the sea to reach dry land, it was well over eight hundred. With heart racing and adrenalin pumping at full blast, I drove down the ramp into the water, hoping and silently praying that I had carried out the waterproofing of my car successfully. The skipper waited as we drove slowly down the ramp into the water to see if he had picked a good position to off-load us into the sea before releasing the other vehicles on board. He must have realised that he had put us down onto a sandbar because he saw us drive off it into very deep water and I was soon within the last inch or two of my sea wading capability. The rough sea was almost up to the top of the specially erected wood and canvas structure, built on top of the officer’s sliding roof hatch of our HSCs (rather like a submarine conning tower). These gave us the ability to wade through deeper water. Our height was now almost two metres, but even so driving in that rough sea was a bit ‘hairy’ because some water did come into the car over the top of the ‘conning tower’. Because the car was completely submerged, all I could see was the water lapping against my glass visor as I kept the car moving steadily over the seabed towards the shore. I was far too busy concentrating on the job in hand to be very frightened about the situation. If my engine stalled it would have been a disaster. Quite naturally, anxiety was definitely uppermost in my mind. Lieutenant Michael Wild, my Troop Leader, and I were in the car of D Squadron; Lieutenant Richard Brett-Smith and Corporal Harry Davis the C Squadron car. We drove along under the water for what seemed ages before, thankfully, daylight crept into the car and we started to rise above water level. At last we were on French soil and I started to drive up the sandy beach. At this stage we were considerably relieved and happy to have survived the sea journey, especially through the straights of Dover, where we could so easily have been shelled by the German shore batteries on the French coast. The wading ashore onto the French beach proved a bit of a problem because we only managed about fifty yards before our luck ran out. The reason we were in difficulties was that as we moved slowly up the beach, we drove into very soft sand and, due to the weight of the cars, we sank and became bogged down to our flat bottom plates. We were left stranded by the LCT in the soft sand, with our wheels spinning, unable to drive out. Both cars were helpless ‘sitting ducks’ throughout our first day in France. I forced my roof hatch open and got my head out in time to hear Mr Wild shout to Mr Brett-Smith that the LCT had pulled up its ramp having left us stranded. We watched as the skipper sailed his craft further along the landing beaches towards Arromanches. A German air raid started, but luckily for us we were not the targets. It was still a bit ‘nasty’ though, because the JU88s came in so low over us flying towards Arromanches. Luckily no trigger-happy bomb aimers. We were alone on that part of JUNO beach for the rest of the day until the late evening. Whilst we waited, it started to rain and we were very wet and miserable. During the campaign in North-West Europe, every armoured car in the regiment was issued with a half-pint clip-topped, leather-covered bottle in which we carried our individual car’s rum ration. It was to give us a very quick intake of calories and warmth in seriously bad inclement weather. Mr Wild decided that what we had been through was definitely ‘inclement weather’, and so he ordered, ‘Splice the Main Brace’ (Rum Issue). The rum and some food cheered us up a little. It was well after dark before the Beach Master’s team eventually pulled us out of the soft sand. When we drove the last hundred yards off the beach we came onto a narrow track. It was between the beach and the road that ran between Courseulles-sur-Mer and Bernieres-sur-Mer. A very tired Lance Corporal Military Policeman met us and we asked him if he knew where our regiment was located – we had no radio contact yet. He said that we were the only ones to land there that day. He stretched out his left arm and with a big grin on his face, he said, ‘But I am to tell you to go that a’way.’ He had been there all day and was a lonely and quite fed up young man. Now we were all a bit upset. If anyone had had the temerity to ask us: ‘Went the day well?’ Not b***** likely! That night we drove into a nearby empty field and we were told to spread out and dig in, and to make sure we slept below ground level. The German Luftwaffe had started to drop butterfly bombs; these on exploding spread small killing shrapnel, very close to the ground. After the officers went off somewhere, I positioned my car next to a hedge and dug a trench at its base. I decided to sleep on the grass at the side of the trench, quite sure that if we had another air raid or if German artillery started to shell us during the night, I would have plenty of time to roll into it. I felt so tired that I immediately fell into a deep sleep. When I woke up the next morning and before I opened my eyes, I heard a terribly loud continuous buzzing sound. When I opened my eyes slowly in the unexpected bright sunshine I turned over, and on looking through the base of the hedge into the next field, I was looking into the face of the bloated, rotting, decomposing corpse of a dead German soldier. The body was covered in thousands of flies. Goodness knows how long he had been there – the war must have passed him by several days before. The dark dank, sickly smell of death and putrefaction was so strong, I was immediately violently sick. I will never ever forget that most nauseating prologue to what was to be my introduction to first hand close combat warfare. I then realised that this sort of sight and experience was to become part of my young life in the front line over the next eleven months. ‘Providentially, soldiers are not given to dwelling too much on the fate which they may meet in war, but sometimes in reading the bare history of battles won and lost, one has to pause for a brief moment to think how they would have appeared in the mind of the individual soldier fighting them.’ The next morning we left our overnight stop and drove through the countryside to Ryes to re-join B Squadron and our guns, and we carried out de-waterproofing and checking over our cars on the 15th. On the morning of the 16th B Squadron and the Gun Troops finally caught up with RHQ, C and D Squadrons and so we began to learn about the first few days of the regiment’s initial activities in France. C and D Squadrons had been in action, carrying out dangerous patrols during that first push to Villers Bocage on 12 and 13 June. The patrols included the areas of Briquessard, La Paumerie, Livre, Cahagnes, Tilly-sur-Seulles, and the deathly village of St Germain d’Ectot. This proved to have been a busy time for everyone. The enemy put in a counter-attack, and our advance was halted. Everyone had a hard time and many casualties, and by the evening the enemy had caused 7th Armoured Div to contract into a defensive box nicknamed the ‘Island’. 5th Royal Horse Artillery (RHA), firing over open gun sights and using classical defensive fire, halted the enemy counter-attack, which they called off and so saved those in the box. On 14 June the regiment was once more in the thick of it and it was decided to pull 7th Armoured Div back to Briquessard. Later during the night D Squadron was sent to Gueron near Bayeux. On the way Mr Newton’s DAC (3 Troop Leader) ran over a Military Policeman and wrecked his motorcycle. He wasn’t hurt but he swore a lot, mostly because he could not reach his kit strapped to the underside of his bike. The next morning the Guns finally caught up with our Squadrons. The names of the towns and villages fought in during those early days, particularly St Germain d’Ectot will not be forgotten because of the casualties we sustained and the new bitter experience we learned patrolling in bocage country. I listened intently to the horrifying stories of warfare in the close bocage country, of troops who expended every single round of their small arms ammunition in a morning and of enemy snipers and artillery who ‘didn’t play fair when your only weapon to fight back with was a shovel.’ After a short break the regiment was soon back in action again but this time each squadron had the support of its Gun Troop, which was a morale booster as well as a bonus. I was blooded during the time we were sent to the area in and around Cahagnes and Tilly-sur-Seulles for the battle when we finally took Villers Bocage. On the way the guns proved themselves and most definitely earned their keep by causing many enemy casualties. Armoured car reconnaissance was proving to be extremely difficult because of the Normandy bocage countryside, since troops on patrol were almost powerless to detect the presence of the enemy, let alone its strength at such close quarters. Apart from our own killed and wounded, there had been many near misses and the surviving crews knew only too well how lucky they had been to escape at times. This emphasised the need for quite serious re-training in new tactics. The regiment was sent into reserve to the Chateau of St André at Juaye and the Commanding Officer ordered a detailed re-training programme. We were able to use the parkland of the chateau for this. We also had time for football matches and several trips to Bayeux. The regiment crossed the river over ‘London Bridge’ having left St André on 17 July, and turned south to move among the congested outskirts east and then south of Caen. ‘A’ Squadron had only shortly arrived before we left the grounds of the chateau and was with D and RHQ Squadrons trying to get into position on the right of the corps front to join 11th and Guards Armoured Divisions for Operation GOODWOOD. The traffic jam caused by three armoured divisions having to cross the river and canal east of Caen using just two bridges and to squeeze into an area only three miles wide was a bit trying. We took our share of the enemy shelling and bombing again, and during the air raid that night one German bomber managed to get through the anti-aircraft barrage and A Squadron unfortunately became its target. Butterfly and heavy bombs scored direct hits and casualties were disastrous. Nine officers and men were killed and six others wounded. The operation was memorable for us because of the acute unpleasantness we were subjected to and the resulting removal of our General, ‘Bobby’ Erskine, our most experienced and respected commander of 7th Armoured Division. We suffered such heavy casualties and tank losses GOODWOOD was called off. During the next few days rain fell day and night soaking our cars, our bedding and clothing and turning our slit trench into clammy baths. The French said that it was the wettest and the worst summer for 60 years. Besides the rain, which drenched everything, there was the dust when it did not rain. This was equally unpleasant and turned the cars, our faces, our bedding and brown and crimson berets a dull, misty grey. Extremely virulent mosquitoes continually added to our further personal discomfort during this period, as they seemed to thrive on the anti-mosquito cream supplied by the medical teams. From the aspect of sheer discomfort, many of us reckoned that the three days we spent in the city, factory area and area south of Caen were the worst in the whole of the Normandy campaign. We spent our last night in Caen on the racecourse. Next morning we left what had been the most beautiful city in Normandy, now devastated and little more than heaps of stones and rubble. Those who saw the destruction of the city and the factory area would never forget either of them or the days that we spent there. The regiment went back across the Orne to rest for a while at Anisy and then we returned to the chateau at St André. My troop leader, Mr Wild, was injured in a car accident and had to be medically evacuated to UK. Sergeant Andrews took over the troop until we got a new officer and I carried on doing the gun surveying. During the night of 25 July we moved southwards through La Belle Epine to start patrolling back to St Germain d’Ectot and to the outskirts of Caumont once again. Our starting point for the ‘breakout’ was to be Caumont and after motoring all night we were on the outskirts on 31 July. The Squadron started from Cahagnes with orders to patrol the road to Villers Bocage and on to Aunay-sur-Odon. That night we were bombed heavily again and Mr Llewellen-Palmer was killed and Mr Newton and two others were wounded, several cars were hit. On 5 August, Sergeant Wilf Luke with 5 Troop entered the main square of Aunay-sur-Odon and was met by 3 Troop C Squadron coming in from another direction. Aunay, which had been destroyed by our bombers and artillery, was considered the most devastated town in France. The only thing still standing when later I drove through the town, was the hollow battered church tower. The squadron was under constant shelling from the German artillery when we reached the high ground south west of Thury-Harcourt on 6 August. It was from this area that the Gun Troops of the regiment were sent off to do some serious shooting as a complete battery with the 5th RHA that lasted until last light, when we could no longer get any accuracy using the gun sight clinometers. We acquitted ourselves very well and split up to rejoin our squadrons. By 13 August the battle of the Falaise Gap was under way and it lasted for several days. One of my worst experiences in Normandy was the disturbing journey from Thury Harcourt, where we took a lot of enemy shelling and mortaring. We were ordered to drive the route passing across the northern area of the battle of the Falaise Gap. The American army had pushed across France from the west to Falaise and the British, Canadian and Polish armies moved south from Caen to close the gap north of Falaise in the attempt to entrap the German army in Normandy. The result of that devastatingly, fearful battle was that thousands of men and horses were killed and were left for a time on the roads, on the tracks, in the fields throughout the countryside. The abandoned ruined equipment, the paraphernalia and the bodies covering that beautiful part of Normandy was an appalling sight. We had to wet our scarves and handkerchiefs to cover our mouths and noses to try to cut out the awful stench. This was caused by the smell of rotting crops, the nasty unpleasant all-consuming odour of dead men, farm animals and dead bloated army horses, to say nothing of the wet horrid stink of the churned up mud. Traffic jams clogged up the roads, because of the large number of vehicles and equipment on the move as well as the abandoned equipment and the ruins of a retreating army. There were also hundreds of German prisoners of war who had to be dealt with. If it was not chaos, then it was a hell of a muddle. Those of us who were there and witnessed the carnage will never forget the revulsion and the unspeakably dreadful horror of it all for the rest of our lives. But memories of these experiences do fade: although you do not think so at the time, they do do so, because your mind protects you. Whilst Sergeant Andrews was acting Gun Troop leader he was still the No 1 gun sergeant, so I continued to be responsible for most of the gun surveying until Lieutenant Sexty arrived from 5 Troop. After we left Aunay-sur-Odon a second time and the Falaise Gap battlefield, on 16 August the squadron was moved to Egbed Cremesnil and put under command of the Canadian Armoured Division. Once more we carried out dangerous reconnaissance patrols that included Bernieres, Point-de-Jort, and up to Saint Pierre-sur-Dives. On 20 August we were on our way towards Livarot and Lisieux and at the Livarot crossroads my very close friend, Johnny Philpin was killed and the SS captured Nick Crispin, his Dingo commander. Three of the Squadron Troops were finding it difficult to advance and were kept busy fighting their way forward because of the increased enemy activity. The Gun Troops were very much in demand, taking targets set up for us by the leading Sabre Troops, who found that so much help was needed to clear the enemy. I was called on to convert target corrections to the Gun Sergeants with increased regularity. From Lisieux we drove up to the River Risle, south of Foret de Montfort, and moved on to Boissey, to thiberville and on to Brionne. When we got to Brionne the Gun Troop was ordered to cross the Canadian-built bridge over the River Risle and to turn south. There was a bit of nonsense because the Canadians didn’t like outsiders using their bridge. Sergeant Andrews and I in the leading car, to our surprise we were prevented from crossing the bridge. After an argument, the Canadians put the Gun Troop under arrest. Sergeant Andrews got very hot under the collar and our squadron Leader was terribly angry with the Canadians. He said he wanted no nonsense, as we wished to get on with the war. We were soon released. The guns were now in even more frequent use, but with only two 75s supporting each squadron, the RHA and the RAF Typhoons were on call for targets beyond our scope. If artillery support was needed the squadron leader would call for help from RHQ (code name Shell Drake). If the squadron leader was in need of help from the RAF Typhoons he could call on them through RHQ (code name Red Pansy). At RHQ a special radio frequency for the regimental RAF Liaison Officer was available for him to speak direct to aircraft pilots in the flying ‘Taxi Rank’. Our own artillery shelled the squadron when we got so close to the enemy that the rounds that fell near us were often the ranging shots on enemy targets. Sometime because of our closeness to the bomb line, there was little wonder that we were attacked by our typhoons and thunderbolts, even when we used our air recognition panels. We expected that we got from Messerschmitts and Focke-Wulfs. And always waiting for us were attacks by Nebelwerfers (multi-barrelled mortars we nicknamed Moaning Minnies) and dug in tanks and anti-tank guns. Occasionally heavy armour showed up to surprise us, land mines got in the way, as well as snipers and enemy with hand-held Panzerfaust, these too were always around to hold us up. Enemy infantry played their part in trying to stop us by their withering rifle and machine gun fire. The sound of a German Spandau machine gun firing at you always gives ‘cause for concern’. Notwithstanding ‘bomb line’ disturbances, aircraft of the RAF and the support of our Royal Artillery were more than their match and our Divisional motorised infantry were often our salvation. It was on 21 August that 4 Troop was embroiled in a suicidal attack from the nearby forest by a unit of the Hitler Youth. For the next four days our guns were in constant demand, causing considerable damage and large numbers of casualties. We found it hard to keep up sometimes and at one time we pushed on 30 miles in one day. We fired so much ammunition that we had to have daily replenishment. Although the Germans were retreating it did not mean they were disorganised. On several occasions we were able to lay our guns on to targets that were in full view so that both Gun Sergeants were able to shoot over open sights. Morale was high because we were on our way to finishing the war. The squadron then patrolled and fought our way down to Evreux and on to Louviers where we crossed the Seine and soon we were in action again from La Feuille. On 2 September we crossed the Somme and patrolled through Bernaville, Doullens and spent the night in Nuncq before making our way the next day to Mazingarbe. On 4 September we moved at speed through Meurchin, Carvin, and Seclan and Templemars and we were quickly on the outskirts of Lille. 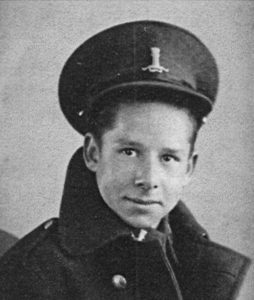 Sergeant Wilf Luke MM, Troop Leader 5 Troop, was the first troop to reach the city centre and was seriously held up by the population. His reception was one of considerable excitement and the crowd hemmed each car in, then everyone enjoyed incredible ‘hospitality and refreshment’. The squadron had to wait for 5 Troop to catch up to us on the outskirts of Lille but it took ages for Sergeant Luke to unglue this troop from the city. The complete Squadron waited all afternoon in Lille until last light and then as night fell we left France and motored into Belgium. We caught up with the regiment at Oudenaarde on 5 September. We were now at the beginning of a different and new war experience. Thank goodness, no sandy beach to invade, no dreaded bocage country, not so much terrible sorrow caused by witnessing the appalling devastation of those beautiful cities and towns we saw in France.